Since I created a page like this for the original Happy Forest colonies, I figured I might as well keep things going by creating one for each TK- or PFHC-managed colony. This colony is the fourth TNR project, on a dairy farm property where people keep dumping their unwanted cats. With the exception of the RIP list, these lists are in chronological order from date brought in to TKHQ. The RIP list is, as closely as I can get it, in chronological order by date of death. (This colony was a TinyKittens project, not a joint project with LAPS.) The lists generally just contain brief information and key dates for the cats/kittens — pages with more detailed information are under construction. These are cats and kittens who were trapped at the colony or were taken in temporarily and/or socialized to some degree by neighbours of the property where the colony is and who subsequently went on to be adopted into forever homes. All surviving kittens from these litters were adopted into loving homes. 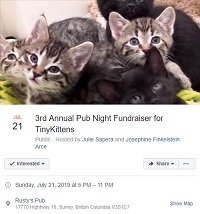 Because they were all born and raised in the care of humans, these kittens wouldn’t technically be considered ferals…but they are products of the feral colony and thus the happily ever afters for the kittens who survived qualify for listing here. Red – Red is a lovely ginger boy; he, like Evolene, is thought to be about six years old and is fairly friendly with people. (It isn’t something that can be known for sure, but I wonder if perhaps he and Evolene were litter mates who were dumped together at the farm.) He was brought in for his neuter and to get his bad teeth worked on. (He had four teeth pulled.) He hung out at TKHQ for awhile (off-cam) while he recovered and then returned to his colony. Evolene’s first born boy, Benedict — he was born breach and his birth was long and rough; at some point during that difficult birth (or possibly due to a congenital issue), his tail at birth was degloved (i.e. missing the top layer of skin and hair). He was taken in to Mountain View late on April 8, 2017, where they removed the injured portion of his tail. However, he still failed to thrive and passed away on April 9, 2017. Evolene’s last born girl, Easter — she was the second smallest of Evolene’s kittens and just failed to thrive; she passed away on April 9, 2017. Evolene’s remaining kittens — boy Tamago, smallest girl Peep , and finally Cadbury — also failed to thrive and one-by-one also passed away during the early morning hours of April 10, 2017.